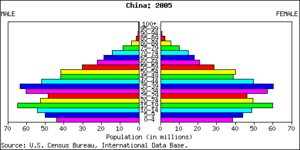 A population pyramid is a graph. It has two back-to-back bars. These bars show the population in groups of ages, with woman in one side and man in the other side. The pyramids usually show the development of a country. When you look a pyramid you can see the life conditions of the country. In this type of graph, a wide base means a very high birth rate and a narrow base means a high death rate. Median age by country. A youth bulge is evident for Africa, and to a lesser extent for South and Southeast Asia and Central America. 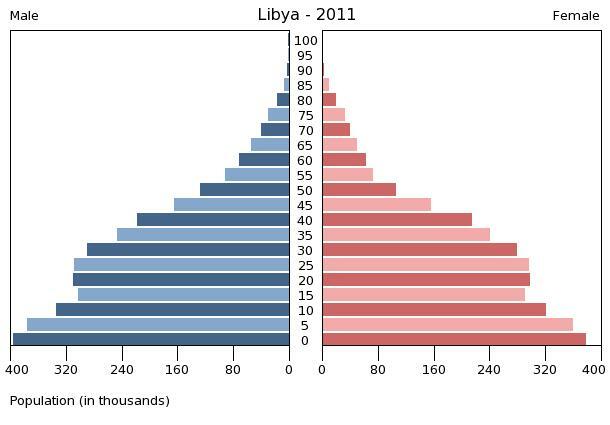 Nearly half of Libya's 2011 population consists of children younger than age 20. 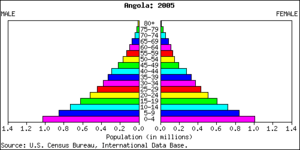 Population pyramid Facts for Kids. Kiddle Encyclopedia.